Slice the beetroot and strawberries. Add all ingredients into the blender and mix until desired consistency is achieved. 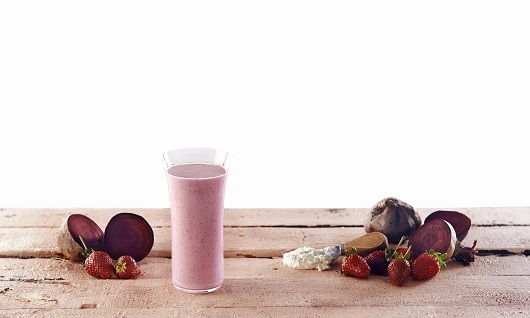 Serve straight away (this shake tastes best when it’s cold!). You can garnish the serving glass with a slice of strawberry. Formula 1 is a delicious healthy meal that provides an excellent balance of high quality protein from milk and soy, essential micronutrients and added botanicals and hers. **When using Formula 1 meal replacement shakes for the purposes of weight control or weight management, please check carefully the instructions on the product label. Only when prepared as instructed on the product label does our product deliver the full nutrition benefits described on that label. Always remember when creating new recipes to assure that the cumulative intake of nutrients is not too excessive. Also, please remember that if the products are used in heated recipes, some vitamin levels may decline. The nutritional values shown here are based on Formula 1 ingredient combinations in the EU.